Nonresident taxation on professional athletes gained national attention in the early 1990s as Illinois retaliated against California’s nonresident tax on Michael Jordan and his Chicago Bulls teammates following their 1991 National Basketball Association (NBA) Championship against the Los Angeles Lakers by enacting their own tax on professional athletes visiting the state. Now 25 years after enacting Michel Jordan’s revenge and escalating the use of the jock tax among states and cities, Illinois this past year gave back to their own resident athletes by lowering their income tax rate by 25%. In 2011, Illinois legislature narrowly passed a bill that raise the individual tax rate by 67% from 3% to 5%. The individual tax rate increase combined with a corporate tax rate increase that was projected to raise approximately $6.5 billion per year. Fortunately, the same law that included the tax increase had a provision in it that was to drop the rate back to 3.75% in 2015 and to 3.5% in 2025. As we start the 2015 tax season, it provides us an opportunity to review the potential tax savings for a few of Chicago biggest name athletes and see what their actual tax saving will be on their Illinois state tax. All three of the players listed above receive over a million dollars in Illinois state tax savings over the life of their current contract with Jon Lester receiving the largest savings at $1,937,314. Since the full tax savings will be received over the life of the contract and not in one lump sum, the present value of the savings has also been calculated. A discount rate of 4.6% was used by taking the average of the S&P 500 over the past ten years and the increase of the consumer price index (CPI) since 2010. These tax savings come at a cost. By lowering the state’s income tax rate, it also limits the tax credit for jock taxes paid to other states to the same 3.75% rate. Therefore, although the players will still receive the above tax savings on their Illinois state tax, their credit for taxes paid to other states will be lowered and their burden of tax on other states will increase. 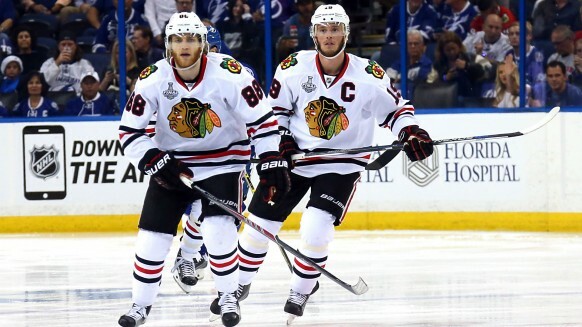 The Chicago Blackhawks played in 16 different tax jurisdictions during the 2014-15 season. By lowering the tax credit for taxes paid to 3.75% it would lower both Kane and Toews credit for taxes paid to other states by $32,666 in 2015. Using 2015 as a benchmark, both Kane and Toews could expect their actual savings over the term of their contract to be limited to $788,461. Rarely do state’s tax policies benefits professional athletes. However, Illinois lowering of their tax rate has done exactly that. Although Athletes lose a percentage of their tax credit for taxes paid to other states with the lowering of the state’s income tax rate – as shown in the above example with Jonathan Toews and Patrick Kane the savings still outweighs the loss of credit. Be sure to organize your papers. This minimizes the time and expense its takes to prepare your taxes—and frees our advisors to concentrate on lowering your tax burden rather than tracking down data. Fill out the tax questionnaire carefully and completely and separate your tax forms and receipts into different envelopes. If you enjoy our content, please feel free to share it. Copyright © 2019 AFP Consulting, LLC – Jock Tax Professionals. All rights reserved.